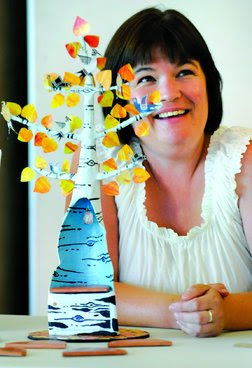 Rachel Slick shows a representation of the “Reading Tree,” a storyteller’s chair for the new library’s Children’s Room. “Reading Tree” was selected as the winning design for the storyteller’s chair after an open house at the Durango Community Recreation Center on Monday. A majestic Aspen “Reading Tree” and a larger-than-life-sized card catalog have been chosen as the two public-art pieces for the new Durango Public Library. After a public open house Monday at the Durango Community Recreation Center, a selection panel with three members of the Durango Public Art Commission, a member of the Durango Public Library board of directors, the director of the library, a member of the library staff, two members from the community who do not earn their living in the arts and an arts professional from the community selected Rachel Slick’s aspen tree storyteller chair and Jay Dougan’s card-catalog sculpture. The “Reading Tree” will be 8 feet tall and 48 inches wide at the top with a 24-inch-wide trunk, made from a steel armature, fiberglass and resin. The chair’s finish will be hard and nontoxic and provide a slick surface that’s easily wiped down. Bright colorful leaves and birds are fastened at a height children may see, but not reach. The birds all will be Durango natives – a barn swallow, a downy woodpecker, an American goldfinch and a redwing blackbird. A reading light will be installed above the reader to illuminate the story. A custom-made cushion will be made from high-quality outdoor fabric that is washable and resistant to stain, soil, tear, mildew and fading. Five additional cushions for children also will be provided. Slick has completed work for the public-art commissions of Tucson, Ariz.; Redwood City, Calif.; Park City, Utah; Mountainview, Calif.; the Port of San Diego; and Troy, Ohio. She studied art at the Gerrit Rietveld Academy of Fine Arts in Amsterdam, the Netherlands, and was the recipient of a Robert Rauschenberg Grant in 2003. Dougan, an assistant professor of art, ceramics and sculpture at Fort Lewis College, proposed an integrated design that will become part of the building, rather than simply a sculpture placed in a building. Dougan’s “Card Catalogue” will organize the stairwell space while playing homage to the history of libraries. Jay Dougan’s “Card Catalog” will fill the library stairwell. The stairwell will become a giant card catalog, with the drawers protruding a mere 2 inches from the wall made from the same maple paneling as the rest of the stairwell. Each catalog drawer will be about 2 feet by 2½ feet and randomly emerge from the walls in different locations. The challenge for Dougan and the library will be to create the sculpture while accommodating an ever-growing list of donors who are also to be acknowledged with plaques in the stairwell. Dougan said the library has more donors than it originally anticipated. The budget for the storyteller chair is $15,000. The budget for the stairwell sculpture is $20,000. Both artists are responsible for creating and installing the final artwork. The call for artist proposals was sent out in early June, and deadline for submissions was June 30. Artists from New Mexico, Utah, Colorado and Arizona were eligible. The selection panel narrowed initial submissions to three finalists for each project. The six finalists made presentations to the public Monday. Finalists each received a stipend of $150 to help cover travel expenses to Durango for the public presentation. 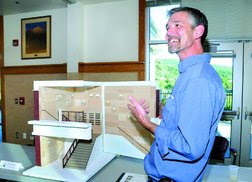 Both works will be installed and available for public viewing, before the Dec. 1, Durango Public Library grand opening. artsjournalist@mac.comLeanne Goebel is a freelance writer specializing in the arts.